South Asian Americans are combining art and social justice in exciting ways. Annie Sajid's "Artivism" series profiles young South Asian American artists whose artwork is informed and inspired by their social activism. Nadia J grew up in a small scenic town in Western Maryland where she found herself both surrounded and enchanted by nature. As a child, she had a fervent desire to paint, draw, and sketch anything she could get her hands on. When she was 16-years-old, she discovered Bob Ross. She would wait until her family had fallen asleep, take out her VCR recording of “The Joy of Painting,” and a modest set of paints to paint along with Bob Ross’ electric step-by-step painting tutorial. After seeing the paint transform into nature, she felt like she had discovered a “miraculous” process. Nadia J went on to major in Fine Arts in college, and with the support of her family, she combined her passion for art and science by obtaining a Master’s Degree in Architecture. After working for several years as an architect at a corporate architecture firm and the design-build industry, Nadia found that there was something more she wanted to do with her talents. While she felt a great amount of joy and fulfillment in the work she undertook as an architect, the insight and reach she felt she could achieve with her art and the process of creating art, was an incomparable and unprecedented experience for her. While continuing her work as an architect, she held exhibitions in local art and community centers, and was invited to speak about art, social justice, and spirituality at various local and international conferences/events. After years of doing her art on a part-time basis, it was finally time for Nadia J to fully devote herself to nurturing her creative spirit. In 2011, she became the Coordinator for the group, Muslim Women In the Arts, leading a local group of approximately 30 Muslim women artists, as well as managing over 800 artists globally through social networks. Since then, Nadia has taken on the adventurous feat of working as a professional artist, while undertaking architecture projects on a freelance basis. She is well aware of the systemic challenges and the stigma of working as a full-time artist. She has seen many colleagues and other professionals in the creative industry be exploited for their work. Artists must contend with their meticulously grueling schedules to produce artwork. Yet, many times their production of art is seen as separate from art as a form of a labor. Nadia J continues to tirelessly face these hurdles because she believes that painting and creating art for her is a form of “ibadat” (worship in Arabic). She has found that painting makes life more “livable.” Painting helps her grow intellectually, spiritually, and emotionally. 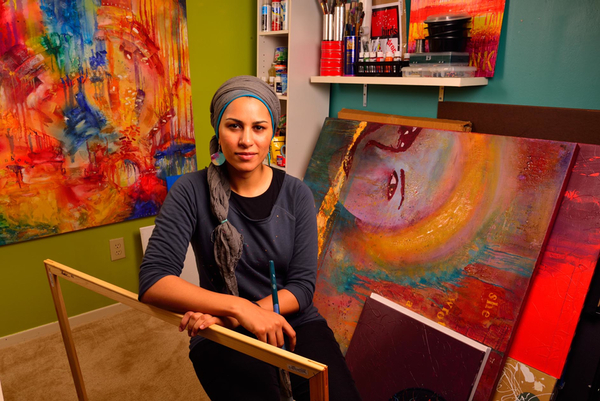 As a Muslim-American woman artist, she has discovered that her South-Asian roots have encouraged her to celebrate struggle through art. Much of her artwork is inspired from the concept of celebrating every day objects and moments as a work of art in themselves, a concept indigenous to both South-Asian art and Islamic art. For Nadia J, one of the most vital forms of activism is to use her art to move individuals to see the world from a different perspective. She believes art can catalyze change by activating parts of a person’s heart, mind, and soul that only creativity can induce. Throughout the interview, Nadia J spoke with a sense of purpose and humility about art. She has never been happier at nurturing her creativity and pursuing “artivism” full-time. You can’t help, but be happy for her, too. Qurratulain "Annie" Sajid is a recent college graduate who majored in English and Women's Studies at the University of Michigan-Ann Arbor. As an aspiring community organizer, she is a firm advocate for liberation, laughter, and pomegranates-in that order.